The ultimate way to have fun, raise funds and make a difference (and also enjoy great beer)! What is the wab community tap? For the last 20 years, we have been very fortunate to get to work with hundreds of amazing local non-profits throughout Metro Detroit. Our DINING FOR A CAUSE program, special events and festivals have helped raise HUNDREDS of thousands of dollars to help support non-profits pursue their wonderful causes. 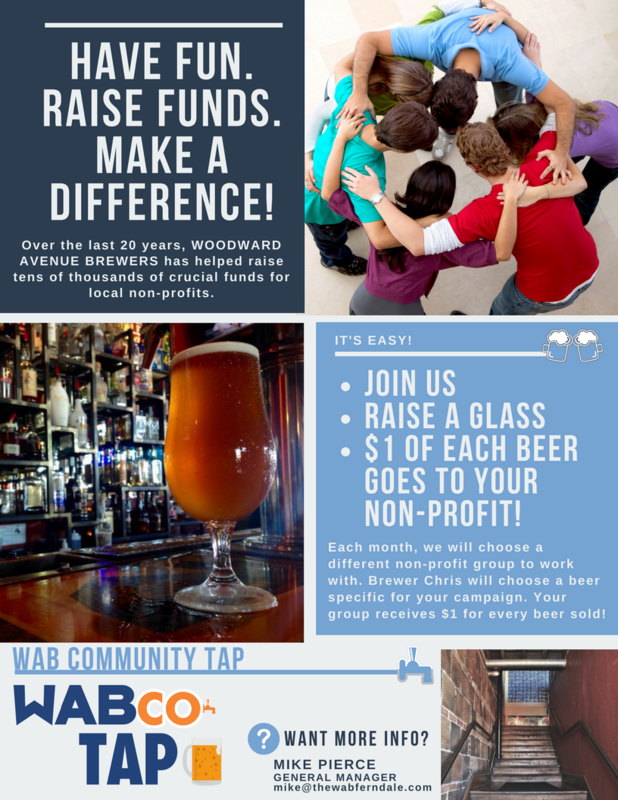 The WAB COMMUNITY TAP is the latest addition to our charitable program, and it's simple! We have 12 spots available through the calendar year. Apply below and if we get to team up, we'll pick one beer each month to represent our WABCO TAP. We promote you and your cause! You gather your forces and throughout the entire month, your group will receive one dollar for every beer purchased off the WABCO TAP! It's that easy! Apply Now! Where can we learn about your group?